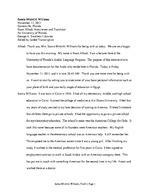 Samia Mishriki Williams, Draft 2, Page 1 Samia Mishriki Williams November 11, 2011 Gainesville, Florida Esam Alhadi, Interviewer and Translator for University of Florida George A. Smathers Libraries Edited by Jardee Transcription Alhadi : Thank you, Mrs. Samia Mishriki Williams for being with us today. We are very happy to have you this morning. My name is Esam Alhadi. I am a lecturer here at the have documentation for the Arabs who reside here in Florida. To day is Friday November 11, 2011, and it is now 10:45 AM. Thank you one more time for being with us. I want to start by asking you to state some of your basic personal information such as your place of birth and your early stages of education in Egypt. Sa mia Williams: I was born in Cairo in 1954. I had all my elementary, middle, and high school education in Cairo. I joined the college of medicine at Ain Shams University. I feel that my years of study are tied to my later decision of coming to America. that children there go to private schools. I had the opportunity to go to a private school took this name because some of its founders were American teachers. My English language teacher in the elementary school was an American lady. I still remember her. This exposed me to the American accent since I was a young girl. After finishing my study, I worked in the medical profession for five years in C airo. I then signed an employment contract to work in Saudi Arabia with an American company there. This has put me in touch with something American for the second time in my life. I went and worked there as a doctor. Samia Mishriki Williams, Draft 2, Page 2 The entire administrative body was A merican, and many of the doctors who were working there were also American. This gave me the opportunity to become familiar with a lot of American traditions and also their celebrations. My first two months there coincided with the Thanksgiving holiday. They invited me and told me about the pecan pie. This was the first step in my life to know about the American living style and culture. Alhadi: When did you come to America? Samia Williams: In 1999. I have been here for about twelve years. Alhadi: Did you come to Florida directly? Samia Williams: Yes. The reason is that the man that I knew and who later became my husband is American and he is from Florida. I came to know him when we were both working for the same company in Saudi Arabia. When w e were getting to know each other, he told me that if we ended up married to each other, he will go back and settle in the area of Gainesville in Florida where his family lives. I told him this will be a big step that I need to think about very thoroughly We, eventually, came and settled here in Gainesville Florida. Alhadi: We will come back to your experience and life in America, but I want to go back to your period in Cairo. When did you graduate from the college of medicine at Ain Shams University? Samia Williams: In 1979. Alhadi: And you worked for five years in Cairo? Samia Williams: True. Samia Mishriki Williams, Draft 2, Page 6 this teaching position. Their answers were all the same. They told me not to hesitate about applying. I told them that I would need a reference letter and they agreed to write letters for me. They told me that they heard about my teaching skills from the students that I used to help. They told me that they knew I was gifted in making the course material very simple and clear. They also heard a bout my unlimited patience and also that I never get annoyed when asked to elaborate on the same subject that I may have explained before. They all stressed their confidence that I will make a great teacher and insisted that I should apply right away. I decided to give it a try. I said to myself that I number of applicants for this position. This is because the position is a very good one and the school is also goo d. They called me for an interview and soon offered me the position. I accepted and started working for Santa Fe College. Alhadi: When did you start working for Santa Fe College? Samia Williams: In 2003. It is now the beginning of my ninth year workin g there. Alhadi: How did you find this shift from one profession to another? Samia Williams: My first year was very hard. That was the year I had to do all the preparation for teaching new courses. I also had to prepare for the lecturing and the lab w ork. I had to be ready for all the questions the students would be asking. The following year was much better. I made some changes and additions to my syllabi and exams. After that, I truly began to enjoy the teaching profession, although it is tiresom e and requires a lot of standing, but nevertheless enjoyable. I am very happy with it. I can truly say I now love teaching and love my students. Alhadi: What do you teach? Samia Mishriki Williams, Draft 2, Page 7 Samia Williams: I teach health related courses. I teach physiology, anatomy, an d microbiology. These are basic courses that anyone who wants to go into the medical or health fields should study. Alhadi: Now, you are apparently settled here in Gainesville, but I need to know if you still have a connection with Cairo and with the res t of your family back in Cairo and in Egypt. Samia Williams: After we came here, my connection with Cairo was very strong because I had an elderly mother there. My father died long ago. I have a brother and a sister who were living with my mother. I us ed to go there every summer to visit and see them and the rest of my relatives, because it was hard for my elderly mother to come and visit me here. still maintaining a s trong connection with the rest of my family through phone calls and the computer. I always talk to my sister and brother and check on their news, especially having in mind the current events in Cairo. Alhadi: How about your connection with the Egyptians and Arabs in general here in Gainesville? Are you in touch with them? them here. I met with one or two of them and they became our friends. Other than that, I Alhadi: I am going to ask you a question and you may chose not to answer it if you feel you know of many Arab men married to American women, but I am not aware of many cases of Arab women married to American men. Your case is one of these unusual experiences. Do you mind to share some thoughts about this unusual experience? Samia Mishriki Williams, Draft 2, Page 9 finished your university education in Egypt and had your M.A. there as well. Now you teach at one of the institutions of higher education here in America. What is the difference in studying and teaching at the college level in the two countries? Samia Williams: One area where you find a huge difference is the number of students in the classroom. Throughout my years of study in Cairo, there were always no less than 1,200 students in each lecture hall that I ever entered. When I came here, there were only 30 students. This is a huge difference for me. It was a very strange feeling for me to be in a classroom as a student and the instructor knows me by name. W hen I started teaching, it many things about their personal lives. This interaction between the teacher and the students is the biggest difference for me. Here, I see my students two or three times a week and I know them by name. This gives the teacher the opportunity to have a bigger o go home and digest and process that huge amount of information on his own. There is no personal daily interaction between the two. I never remember going to talk to one of my instructors in Cairo. This never happens unless there is an unusually pressi ng need or an emergency situation. This is a huge difference. Here, I feel that as a teacher, I will naturally leave an impression on my students, regardless if I want this to happen or not. Of course, I do my best to make this impression positive. I w ork to make this positive impression a tool to help me elevate their level of knowledge. I feel motivated to help them and to make them qualified to succeed and move on to another university or to find a job or become professional in any field they want. Here, the responsibility on the teacher is much bigger. Samia Mishriki Williams, Draft 2, Page 10 Alhadi: I am quite familiar with the comparison you are making and I know very well what you are talking about because I studied at the University of Cairo. I know that it is not unusual to find h undreds or thousands of students in one lecture hall. However, we are approaching the end of this interview, but I still want to know about your relationship with varied aspects of Arabic culture, such as if you still watch Arabic movies, listen to Arabic music or if you do any Arabic readings. Samia Williams: Unfortunately no. I became Americanized very swiftly. Even when I was in Egypt, I used to read in English more than I did in Arabic. This is probably because I went to a private school. It is tr ue that I used to read the newspapers when I was there. The rest of my literature readings were mostly in English. In Saudi Arabia, it was also the same. There was a big library in my work location with a huge number of English books. Reading mostly in English has been a habit of mine and I still do the same. I when I go to Cairo, I love to watch old movies. Alhadi: Does this mean that you are not following close ly what goes on Egypt these days? Samia Williams: I am following what is going on in Egypt. I do follow very closely everything Alhadi: Are you aware of the recent political changes there? Samia Williams: I am constantly following the news. This is the only thing that keeps me watching TV. Also, I get the news from my relatives when I talk to them. Alhadi: What do you think about what is going on in Egypt? Do you see any positive consequences of these chan ges? Samia Mishriki Williams, Draft 2, Page 11 Samia Williams: Sure. There will be positive consequences. However, I am hopeful that these changes will be for the better. There will be a lot of tiring work to do to reach a reasonable level of stability. This level of stability will be achiev ed through the joint work of all parties. I hope there will be security. I pray to Allah to make this possible. Alhadi: I want to go back to your life experiences. You said you lived in Saudi Arabia, but I want to know if you have been to any other Ar abic country. Samia Williams: I visited Yemen and Syria. Alhadi: Were these of personal or work nature? Samia Williams: I went to Yemen to do volunteer work as doctor for one month. After I came here, I planned to go back to Egypt for a visit. Some of my friends in Yemen told me that they had a doctor who was working in a clinic there and she had to leave for some personal reasons. They were looking for someone to take her place as a volunteer. I thought about it and figured that it will be a good idea to take my husband with me and go there. That is what I did. We stayed there for a month and we visited many places while we there. Alhadi: And what about your trip to Syria? Samia Williams: We went there as tourists. We had a great time and it w as a very beautiful place. Alhadi: Which are the non Arab countries you have been to? Samia Williams: I travelled to many European countries before I got married. I visited Britain many times. I have a brother who is married and living there. I also visited Scotland many times. I also went to Australia as a tourist. I visited Germany. I have an uncle who is married and settled there. I also visited Turkey, the Netherlands, and France.